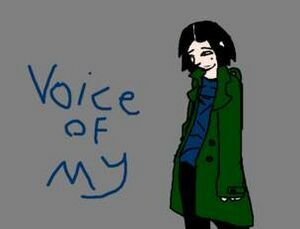 Voice of My (September 11, 1988 - August 18, 2003) was a fanfic author and artist who died tragically at the age of 15 from multi-drug resistant tuberculosis. An obituary  written by her friend, Deref, is followed by a brief ficlet written by Angelboy, who greatly admired her work, is linked to from her page on The Sh33p's Fluff. Daria is Flushed - The author's take on a Trent/Daria shipper. Anaphrodariac - After IICY Daria talks to Jane about sexuality. A Note on the Library Table - The author writes a note from someone at Lawndale High. Morning - Daria gets ready to face another day in Lawndale. The Horrible Prom Mystery - A mystery occurs during prom, and three key witnesses give their accounts of what happened. The Play - Daria and Jane presents a short play on family values. Brain Art - The unusual results of an art contest. Untitled - Daria struggles with writer's block. This page was last edited on 1 May 2009, at 06:57.